When the first Polish rappers appeared in the beginning of the 1990s, they addressed only a small circle of insiders. It was here that the Blokersi expressed themselves, the “people from the tower blocks” who had missed the boat to affluent society’s promising future. Since then, rap and hip-hop have grown into a mass-movement in Poland and have partly dissociated themselves from the vitriolic social criticism, media bashing, and rebellious attitude of the early years. Thus rapper Fisz, born in 1978, strikes a friendlier note: his topics include the delights of marijuana consumption just as the joys and sorrows of love. “Come back, my little feather,” Fisz raps, “without you I’m a giant heavy elephant.” In Frankfurt on the Oder, Fisz can be heard with his band Tworzywo Sztuczne (“Plastic”) and their danceable blend of hip-hop, jazz, soul, and dub. The Berlin band Puppetmastaz combine their electronic beat-driven hip-hop with a colourful stage show in which hand puppets play an important role. The principal characters are the Sicilian frog Croucho, the New York mole Maloke, the hare Snuggles, and Hiphopnotist, the ragamuffin pig. 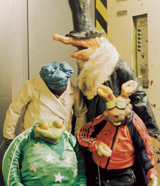 The Puppetmastaz have already released two albums and begin to enjoy international success. With this hip-hop concert Büro Kopernikus participates in the opening ceremony for the German-Polish Year 2005/2006 in Frankfurt on the Oder and Słubice. 8 May 2005, ca. 12:30 a.m. The festivity on the bridge between Frankfurt on the Oder and Słubice crowns “TRIDEM 2005: Paris – Berlin – Warsaw”, a cultural rally for young grown-ups.